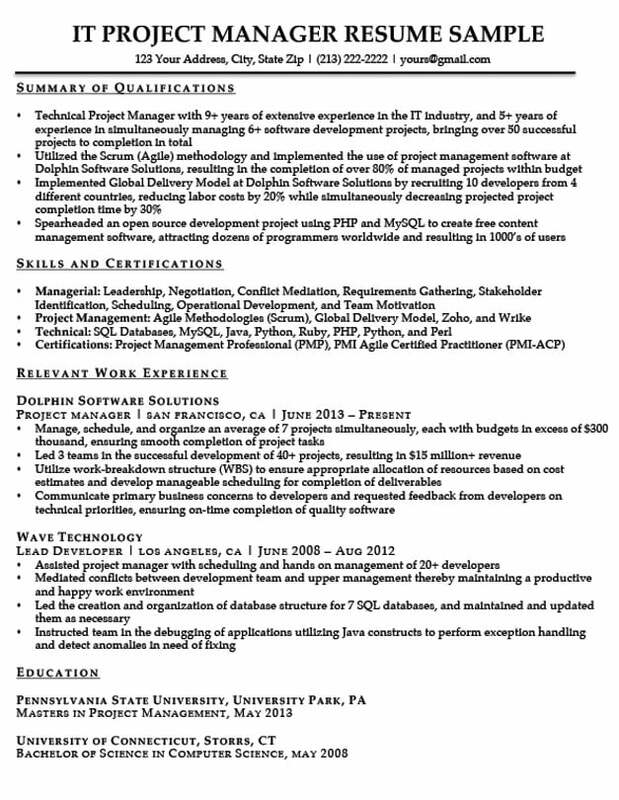 Our project manager resume example and expertly crafted tips are the perfect launchpad for landing your next interview. But if you’re pressed for time, use our resume builder to craft a professional resume tailored to you in minutes! Not quite the resume for you? Browse through our library of resume samples for the one that is perfect for you. Want to make sure your resume will stand out from the crowd? Check out our stylish resume templates for some ideas. Need some help on your cover letter? Take a look at our stellar cover letter samples for ideas. Technical Project Manager with 9+ years of extensive experience in the Information Technology industry, and 5+ years of experience in simultaneously managing 6+ software development projects, bringing over 50 successful projects to completion in total. Utilized the Scrum (Agile) methodology and implemented the use of project management software at Dolphin Software Solutions, resulting in the completion of over 80% of managed projects within budget and on schedule. Implemented Global Delivery Model at Dolphin Software Solutions by recruiting 10 developers from 4 different countries, reducing labor costs by 20% while simultaneously decreasing projected project completion time by 30%. Spearheaded an open source development project using PHP and MySQL to create free content management software, attracting dozens of programmers worldwide and resulting in thousands of users. Technical: SQL Databases, MySQL, Java, Python, Ruby, PHP, Python and Perl. Manage, schedule, and organize an average of 7 projects simultaneously, each with budgets in excess of $300 thousand, ensuring smooth completion of project tasks. Led 3 teams in the successful development of 40+ projects, resulting in over $15 million revenue for the company to date. Utilize work-breakdown structure (WBS) to ensure appropriate allocation of resources based on cost estimates and develop manageable scheduling for completion of deliverables. Communicate primary business concerns to developers and requested feedback from developers on technical priorities, ensuring on-time completion of quality software. Assisted project manager with scheduling and hands on management of 20+ developers. Mediated conflicts between development team and upper management thereby maintaining a productive and happy work environment. Led the creation and organization of database structure for 7 SQL databases and maintained and updated them as necessary. Instructed team in the debugging of applications utilizing Java constructs to perform exception handling and detect anomalies in need of fixing. A project manager is an essential part of the infrastructure of any company. They are the bridges that connect the clients, the company, and employees together. Thus, it is essential that the metaphorical roads of these pathways are well-constructed and clear of obstructions. Project management is a broad position that encompasses a wide array of professional fields. As such, your primary goal as someone seeking a job in project management is to clearly showcase this ability in your resume for potential employers. However, it is also crucial that you present your skillset in a way that appeals to the hiring manager in the field you will be applying to. Following these tips will help you accomplish both of these tasks with flair and enable you to land your dream project management job. What type of projects will I be managing? Do I have experience in the field I am applying to? Depending on the answer, you can tailor your resume to appeal to employers within that specialization. Secondly, you need to determine if you possess knowledge and skills outside of project management in that field. The sample our experts have provided above is an example of the resume of an IT project manager, who has extensive experience working in the information technology field. As such, it is structured in a way that prominently displays both the candidate’s skill in a managerial role, as well as their expertise working in IT. If you don’t have a lot of experience or skills in the specific field you are applying to, fear not, our guide still has you covered. The go-to opening for most resumes is the career objective. However, given the large number of responsibilities you have as a PM, it is likely you are highly experienced, and want to put the spotlight on your long list of accomplishments. Therefore, we suggest using a qualifications summary for your resume introduction. Unlike in a career objective, using a qualifications summary allows you to flesh out your level of experience, and put your peacock feathers on full display. In this case the candidate is able to emphasize their experience in both managing projects, and working in IT. This is invaluable for any company looking to hire an IT project manager. You can use this tactic regardless of your field of expertise. Additionally, a summary of qualifications allows you to show off exactly what you have done during those years of experience. Things like the total number of projects you’ve completed, or the positive impact you’ve made on company revenue – this type of quantifiable information all helps strengthen your application. Check out our guide on how to write a summary of qualifications for a more detailed explanation. Think about the most shining examples of what you have accomplished as a PM and immediately put them on display for the hiring manager. Have you completed many projects within budget and on schedule? Do you simultaneously manage a large number of projects? Do you manage many teams at once or a very large team? Have you completed a large number of projects? Do you manage projects with very big budgets? Have you significantly increased the revenue stream of your company? In addition, if you are able to add how you use specific project management techniques or tools to accomplish these things, it will become the cherry on top of the delicious cake you are feeding to the hiring manager. 3. Emphasize your expertise related to the field in which you are applying. By putting this in the qualifications summary, it immediately tells the hiring manager that you also understand the ins and outs of an IT project. Of course you will need to mould this to fit your field. Your ability to effectively make use of project management methodologies, software, and other techniques is transferable to any field you may want to transition to, and can serve to compensate for any lack of specialized knowledge. If you’re inexperienced, a strong career objective focusing on your worth specifically as a PM can still land you the big interviews. By starting your resume with a summary of qualifications, you can immediately capture the attention of the hiring manager by showing them the best of what you have to offer. Quantification is an important step in creating strong bullet points when writing any resume. If you can give something a number, do it. It is particularly important when writing your work experience. Result: The effect your action had on the problem. Notice that in some cases the problem, action, and result are all quantified. While you may not be able to quantify quite to this level it will give you a good idea of what types of things you can think about when it comes to giving your potential employer the juicy numbers they hunger for. For more tips and ideas on how to craft the best bullet point possible, take a look at the bullet point section of our how to write a resume guide. The key focus of any project manager’s resume skill section should be on their ability to lead a team project and act as a bridge between that team, upper management, and the clients. Only 56% of Project Managers are certified by the Project Management Institute (PMI). Get a PMI certification to stand out! Of course, if you’re not applying for an IT position, a technical skills section listing your knowledge of various programming languages is unnecessary. Instead, as someone applying to an architecture or construction firm for example, you would want to include your skill with software like AutoCAD, Revit, and Sketchup. For a project manager resume, we recommend placing your skills section towards top to ensure your abilities are as prominent as possible. For more information on how to write a resume skills section, check out our detailed guide. While a well organized skills section and achievement-oriented bullets can often speak for themselves, it never hurts to enhance them with a few well placed adjectives. For more inspiration and details on how to strategically use adjectives, check out our detailed guide and list of 135 resume adjectives. Overwhelmed by the idea of writing your resume? Create a perfect resume in 15 minutes with our resume builder!